Dream victories and nightmarish errors punctuated this weekend's rugby in the Aviva Premiership, Guinness Pro12 and HSBC World Sevens Series. Not so long ago, the idea of USA Sevens beating New Zealand in an HSBC World Series tournament would have seemed laughable, but at the Dubai Sevens this weekend they did it for the first time, then repeated the feat a day later. In their pool match the USA – coached by former England coach Mike Friday – edged home 14-12 thanks to a late try from Perry Baker converted by Madison Hughes. New Zealand faced the Eagles again in the third-fourth play-off in the Cup competition and this time the USA romped home 31-12 with two tries from Will Holder and one each from Baker, Folau Niua and Kevin Swiryn. The USA finished sixth in last season’s HSBC Sevens World Series but gave a hint of better things to come as they won their first Cup in London on the last weekend of the series. They have now made a flying start to this season’s competition and will look to build on that in Cape Town next weekend. 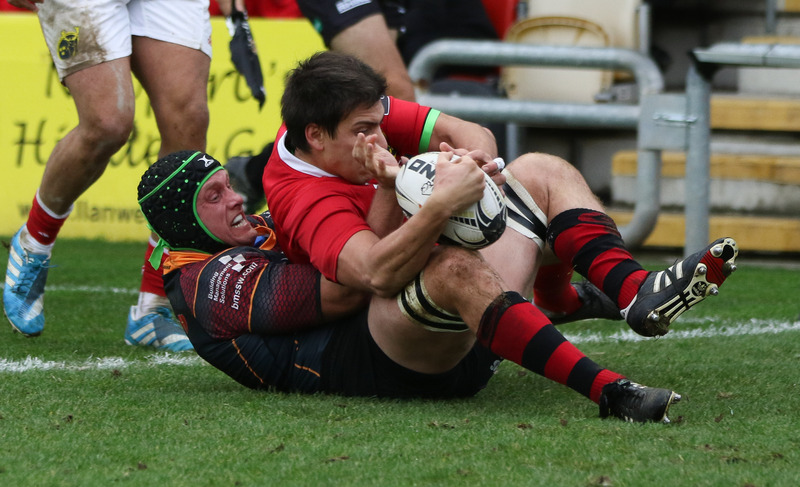 Openside flanker Nic Cudd played a major part in Newport Gwent Dragons’ 22-6 win over Munster in the Guinness Pro12 when, with Munster piling on the pressure and the scoreboard reading 3-3, he made a fantastic try-saving tackle on Lucas Gonzalez Amorosino. Munster had just had a possible try by Simon Zebo disallowed when the Argentine full-back sprinted for the line, choosing not to pass outside to Zebo because Amorosino himself looked odds-on to score. However, Cudd raced back with the best never-say-die attitude, tackled the Munster No 15 short of the line and held him up as they both slid into the in-goal area, finally forcing him to spill the ball. Dragons’ fly-half Dorian Jones was named Man of the Match after he kicked 14 points, including a superb 40-metre drop-goal when the scores were tied at 6-6, and Rynard Landman also deserves praise for a superbly taken try, reaching over his head to touch down when he ended up on his back in the in-goal area. Wasps and Exeter Chiefs treated us all to a hum-dinger of a match in the Aviva Premiership at the Ricoh Arena, with the Chiefs eventually triumphing 41-27. Thomas Waldrom scored a hat-trick of tries but would not claim all the credit for his three scores as they all owed a great deal to the power and technical excellence of the Exeter pack. Every time the Chiefs had a close-range lineout, they set up such a perfect driving maul that Wasps could do nothing to stop them. Waldrom touched down three times, but former England lock Ben Kay gave his Man of the Match award to Mitch Lees for his outstanding performance in the Chiefs’ pack. Steve Shingler kicked the winning points for the Scarlets as they went to the top of the Guinness Pro12 table, thanks to a 22-20 win in Treviso. With four minutes to go, the Welsh side were losing 20-19 when they were awarded a penalty just inside the ten-metre line and wide on the left. It was Shingler’s first place-kick of the match as he had come on as a replacement, but he calmly lined it up and hit the target to claim the crucial four points for his side. 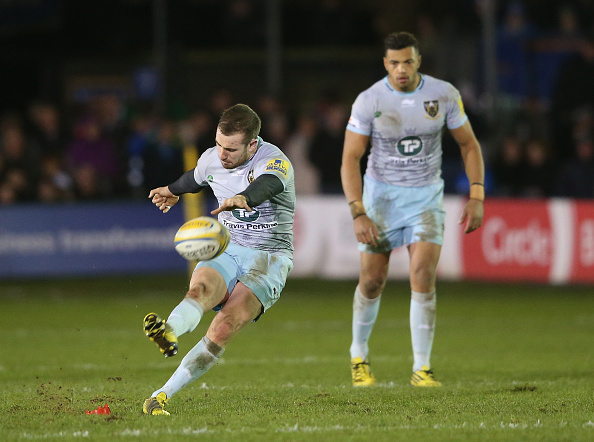 JJ Hanranhan also rose to the occasion at the vital time when he kicked a 40-metre penalty with eight minutes to go, to take Northampton Saints to a 13-11 win over Bath at the Recreation Ground. The chance was set up by his pack, who won a scrum against the head, and Hanrahan rewarded their efforts in the best way possible. Tim Visser ran in a hat-trick in Harlequins’ 38-7 win over London Irish in the Aviva Premiership on Saturday. He took a crash-ball for the first, cut a good line through the defence for the second and strode over wide on the left for the third, after having another effort disallowed because Alex Lewington just took his feet into touch before he grounded the ball. That’s five tries in four Premiership appearances for the Scotland wing now, plus one in Europe – not a bad start to Visser’s time at the Twickenham Stoop. A trio of back row forwards grabbed two tries apiece and helped their teams to welcome wins over the weekend. Justin Tipuric ran in two tries for the Ospreys in their 39-22 win at Zebre, set up a couple more, and was duly named Man of the Match award. No 8 Morgan Allen scored a brace of tries for the Scarlets to help them to a win in Treviso, in his first competitive match after signing from the Ospreys. 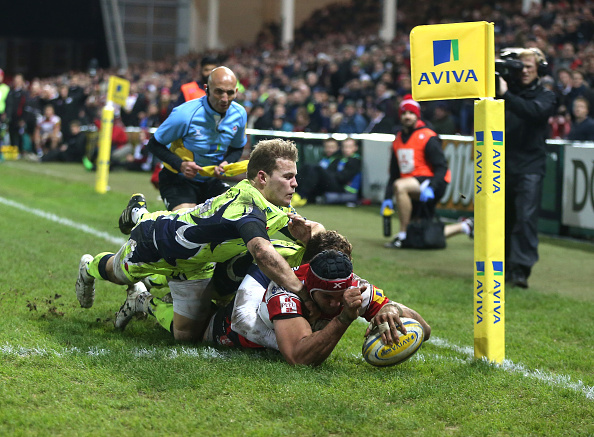 And in the Premiership Sione Kalamafoni crossed the line twice for Gloucester as they beat Sale Sharks 23-19. Connacht captain John Muldoon made history on Friday evening when he became the first player from any team to make 200 Pro12 appearances. Sadly for the blindside flanker, his team did not reward him with a win as they lost 20-16 at Cardiff Blues. Northampton Saints prop Alex Waller reached a significant landmark of his own, as when he came on as a replacement in the 13-11 win over Bath at the Recreation Ground, he became the first player to feature in 100 consecutive Premiership matches. 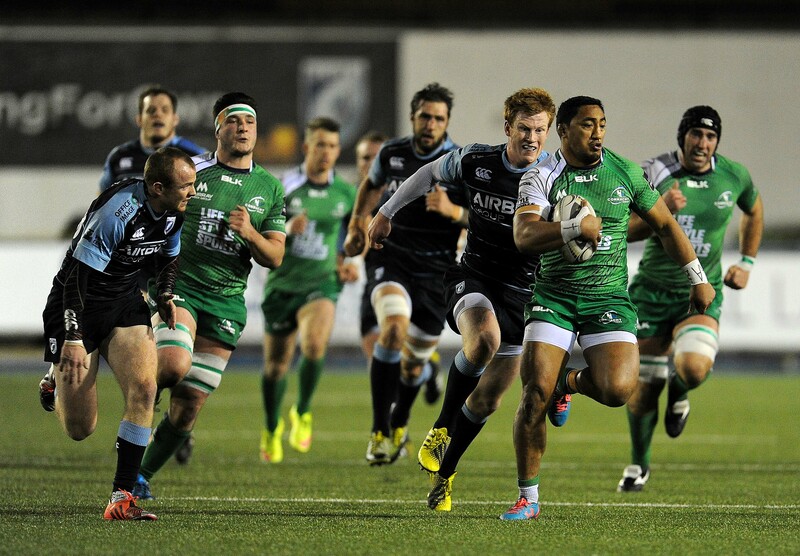 Two Connacht replacements wasted two try-scoring chances during their 20-16 defeat at Cardiff Blues on Friday. First Sean O’Brien spilled a pass from Rory Parata inside the Blues’ 22 after a fantastic 50-metre break from Bundee Aki had sliced open the Welsh defence. Then, Conan O’Donnell knocked on over the line as the Irish side tried to bundle the ball over for a match-winning try in the last five minutes, which meant Connacht had to be content with a losing bonus point and the Scarlets overtook them to take top spot in the Pro12 table. Zebre wing Kayle van Zyl cost his team a try when he failed to tidy up a kick up the right flank by Sam Davies and let Justin Tipuric pounce on it for the easiest of scores for the Ospreys. The Italian side were 15-7 down at the time, so that was extended to 22-7, which left them with a mountain to climb. Ospreys prop Dimitri Arhip would have sympathised with van Zyl by the end of the match, as he knocked the ball on when he was tackled as he was crashing over the try-line. Luckily his mistake wasn’t costly, as the Ospreys were 25-15 up by then and went on to win 39-22. Donncha O’Callaghan was sent off by Wayne Barnes early in the second half of Worcester’s clash with Leicester Tigers, after committing two yellow-card offences. The Ireland lock was sin-binned in the first half for going off his feet at a ruck on the Warriors’ line, when his side were 17-0 up. While he was away the Tigers scored just one converted try and the score was still 17-7 when O’Callaghan was blamed for collapsing a driving maul close to the line and sent off. He wasn’t the only Warrior to get on the wrong side of Barnes, as replacement prop Gareth Milasinovich was sin-binned when a scrum collapsed on the line and blindside flanker Matt Cox was also shown a yellow card for coming in at the side as the Tigers piled on more pressure. Worcester had to play for too long with 14 or 13 men thanks to their own ill-discipline and the Tigers made them pay the price as they won the match 29-20.